This month's Featured Illustrator is Rebecca Gerlings. 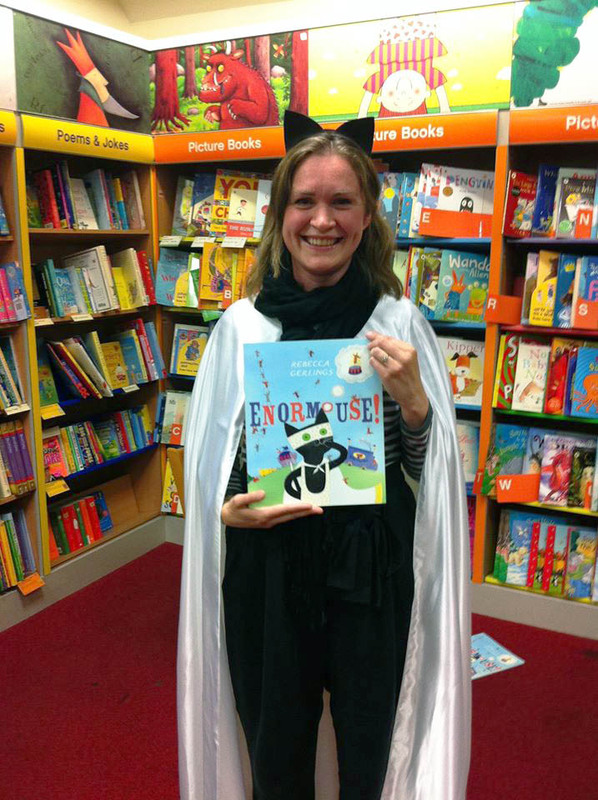 After many years' experience as an editor in children's publishing, Rebecca is now focusing with great success on her own picture books and illustration. See more of Rebecca's work in her Featured Illustrator Gallery. The banner art is taken from the moment the tiny kitten with big ideas in my book Enormouse! dreams up the crackpot scheme that will change his life forever! Drawing has always felt like coming home to me, but my route to illustration has been a bit of a circuitous one. Both my parents were graphic designers, and my family on both sides is peppered with a lot of creative folk. I remember spending many happy hours in the sunny patch on the sitting room carpet drawing with my crayons or felt-tips, and I always relished a school project that required a spot of illustration. 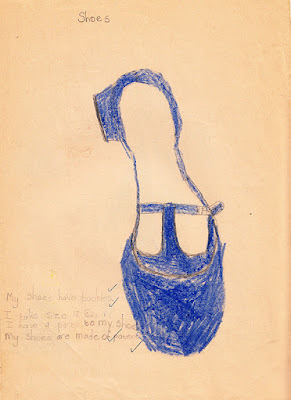 I was very pleased with this drawing — these were my favourite shoes. 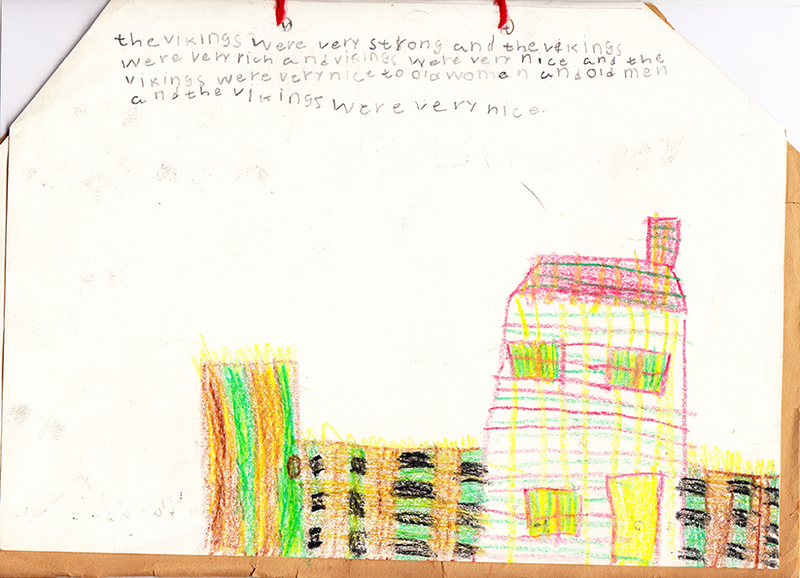 The Vikings were very nice, got it? I did art at GCSE and A level, followed by a foundation course at Chelsea College of Art and Design. 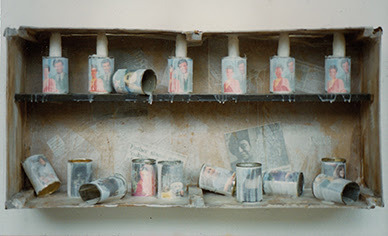 Then I applied for a combined BA in Visual Studies (commercial art practice) and English at Oxford Brookes University, but Visual Studies was replaced by Fine Art not long before the course began. In hindsight, I should have dropped out and applied elsewhere — staying on resulted in a 22-year detour — but at the time it seemed too late to turn back. 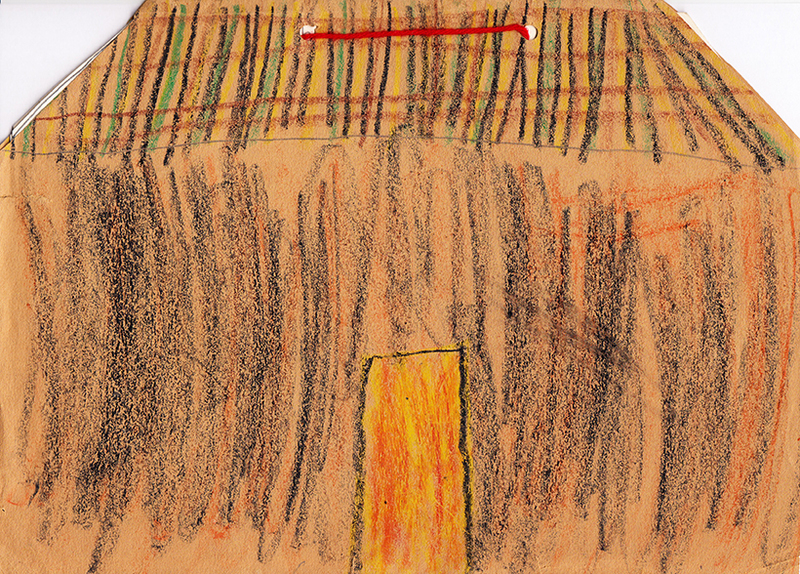 I graduated during the Brit Art explosion absolutely sure I didn’t want to be a gallery artist. One of my first year BA pieces. Illustration was still in the back of my mind, but I was out of practice with drawing — most of my fine art projects had been installations — so I didn’t have an appropriate portfolio. I made some undirected illustration attempts and produced a dummy picture book, but soon realised I’d need to focus on the English side of my degree to earn some money, so I went into book publishing. I had a 15-year career in children’s publishing, making my way up from editorial assistant to commissioning editor with various publishers. It was an invaluable, informative grounding in the industry, and in creating and honing children’s books, but my true love was always illustration. 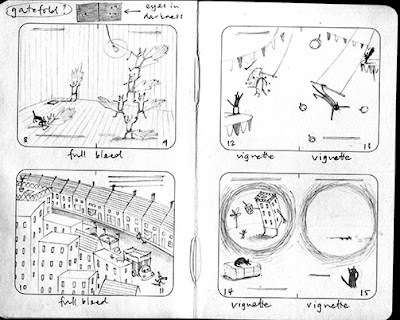 During a period of freelancing, I completed the part-time MA in Sequential Design and Illustration at Brighton University, but I returned to the safety of publishing when I graduated. I still had student debts to pay off, and was looking to buy somewhere to live in London. Starting a new career from scratch seemed like a huge and risky proposition, and anyway, at least I was still working in children’s books — right? 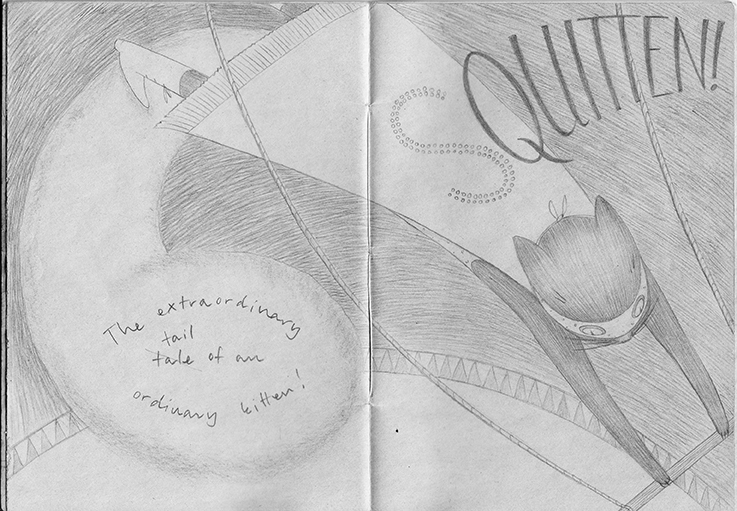 I continued to develop my illustration in my spare time, and put together a dummy picture book called Squitten! (AKA Enormouse’s precursor). I summoned up the courage to show it to one of the picture book designers at Egmont, where I was working at the time, and she took it to the picture book publisher. Everything snowballed from there and, with a bit of a rewrite and a title change, I had a contract in my sticky little hands. 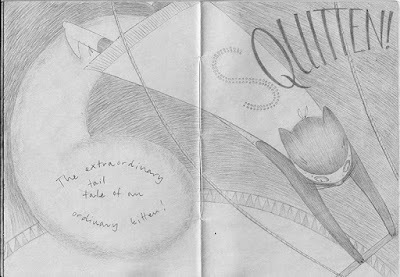 Front cover of my dummy book, Squitten! I was thrilled, but very aware I was going to be learning to illustrate on the job. I worked 9 till 5 at Egmont and illustrated the book at home during weekends and evenings for a year, whilst also undergoing IVF. I won’t lie to you — it was intense! Enormouse! was published 18 months after the birth of my first child. Since then I’ve had another (child, not book), and have been working from home as a children’s writer for hire — a nice bi-product of my time as an editor. 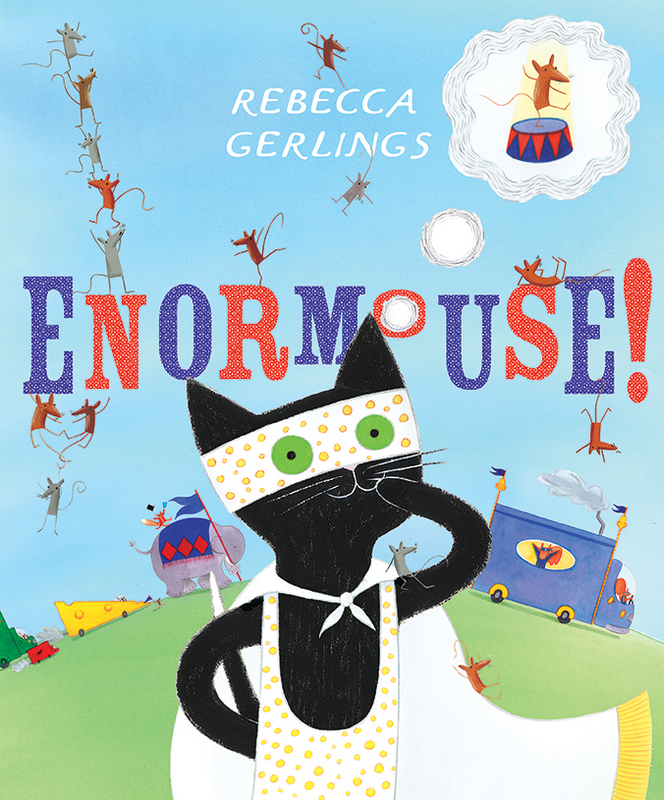 Front cover of my finished book, Enormouse! This year I’ve become the proud owner of a beautiful new garden studio (thanks, Mum), and have signed up with Plum Pudding Illustration after attending a SCBWI portfolio surgery. No more detours . . .
For Enormouse!, I initially made a dummy book, then subsequently did another couple of flat plans after the original story was tweaked. I did the pencil roughs straight on to my final paper, took in any suggested tweaks, then used Dr. Ph. Martin’s Watercolor Inks, coloured pencils and gouache for the finished images. With two small children now, I obviously have far less available work time. I’m developing a quicker process in Photoshop that will incorporate hand-drawn elements. I’m having fun experimenting with colour and composition, and being able to make amends more easily. I’m also slowly learning to love sketchbooks, and I’ve got a few on the go at the moment. I just need to overcome my perfectionist tendencies and embrace the process a bit more. See above — I’m not sure I’m qualified to dispense tips! To see more of Rebecca's work check her Featured Illustrator Gallery. Her personal website can be found here, or click here for her agent Plum Pudding. To email Rebecca click here. Thanks for such an honest, inspiring interview- it's great to read that not everyone falls into illustration straight away and that for some people it takes a more bumpy and scenic route. 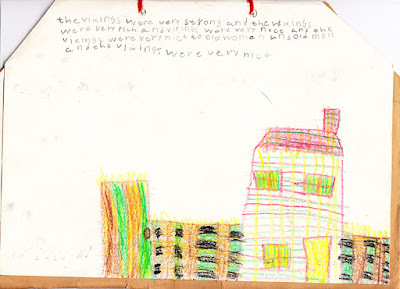 My children loved 'Enormouse' enormousely, and we look forward to reading the next book to come out of the new studio! Good interview - well done Rebecca!